No matter where we come from or what our background might be, I firmly believe that most of us share one single goal. We all want to be millionaires. If not for the sake of it, then as a means of achieving our other primal goals in life. But let’s face it - except in some very few rare cases - a millionaire status is not something that is just going to be handed to you on a silver platter, you’ll have to work for it, and I mean work. Well, maybe you don’t even need a 7-figure bank balance, some people just want to have a pleasant life with lots of free time to take care of what really matters to them, without having to deal with constant work-related stress. Either way, just having a nice job is not going to cut it, we will need to take risky leaps of faith into unknown territories to have a real shot at financial security and independence. If you really want to achieve financial security, then you’re going to need to stop thinking about money. Sounds like an oxymoron, but it really is the key concept. You shouldn’t work to make more money, you need to start thinking about how to make money, work for you. And that is what a smart investment is really all about. You don’t even need large amounts of capital to do it, let me explain. In this rapidly changing economy, the market is also evolving in order to survive. With all these changes, new opportunities blossom and it’s time to take advantage of that. Now more than ever, online trading is available to all of us, so let’s take a closer look at stock tradings and what we need to know before we venture into it. It used to be that in order to trade stocks, you needed the services of a broker, which required large amounts of capital to invest. Not to mention that they weren’t always readily available, and stock trading was limited to few selected countries, due to all existing laws and regulations. However, this all changed with the introduction of Contracts for Difference, or CFDs. In this new concept, you don’t need large sums of money to invest. Instead, you just open a contract and trade on the price movement of said stock, and since it’s just a small percentual value of the entire transaction (sometimes as low as 2%), you can open some CFDs with just a few dollars invested. CFDs give you a much higher leverage than traditional stock trading, they could potentially maximize your earning, but this also magnifies the losses. How to Make Smart Investments. Making your own fortune by trading stocks is a perfectly achievable goal, but it requires discipline and lots of it. Online trading might seem mystical and complicated, but its behaviour can be predicted by using information as our primary tool. The more we know and understand, the better choices we will be able to make. Of course, you can also venture in stock trading without it, but then it wouldn’t be much different than a night at the casino. You could go from King of the Hill to horribly broke, in the blink of an eye. In games of chance there is nothing you can do that would have an effect on the results. But with online stock trading, when you fully grasp all of its dynamics, you can make huge profits even at the downfall of some markets. But what if I don’t even know where to begin? Don’t worry, that usually is the case for most of us. Luckily there are several companies that specialize in CFDs trading, and my recommendation is that you take a look at CMC Markets. Registration is free, and with it, you get access to several hours of educational content. They walk you through from the very beginning and make sure you have all the needed pointers to make smart and safe investments. Now you can finally let the money work for you. Note from Aspiring Millionaire - this article was provided by Tom Hawkins. 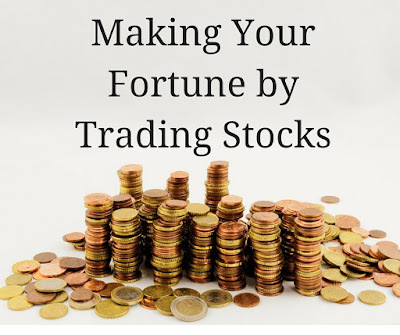 I love investing and stock trading has been one of the things I have done while building my fortune and have discussed on this site regularly.